This Arugula pesto is one of the best anti inflammatory foods, consume everyday along with some pineapple, ginger, turmeric etc in your meals of the day and let minor inflammations take care of themselves. Who says tasty foods are not healthy? 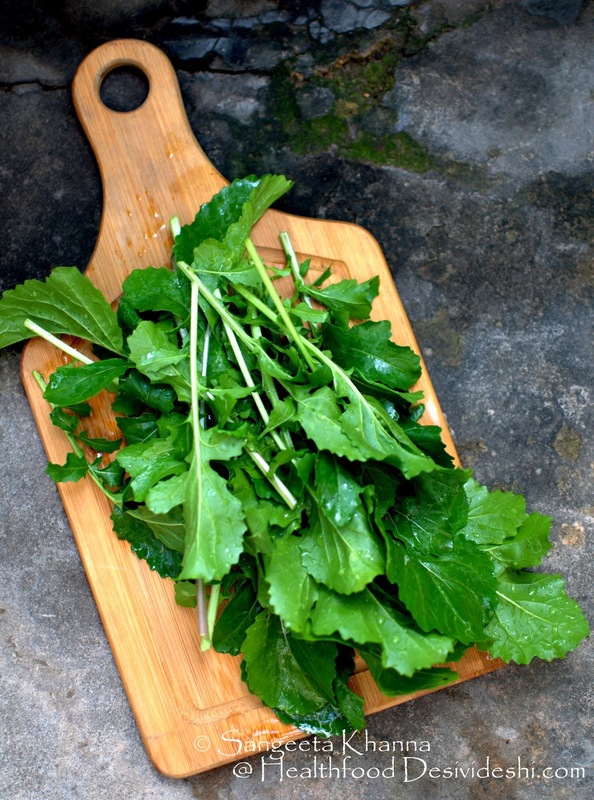 Arugula or Rocket or Roquette is one of the tastiest greens in my opinion. Though I know people who don't like it. I love the way Arugula leaves taste when they are tender and how intensely peppery they become when they are mature. A salad green originating from mediterranian regions, Arugula is a rich source of antioxidants and flavonoids, Vitamin A and K, minerals and most of all it is one of those raw greens that add zing to everyday salads. Worth taking the effort to grow Arugula in pots or in open beds. I have the Rucola variety of rocket leaves as well in the garden and keep alternating them in my salads and pesto. Sometimes I add them to my raita and dips as well. This gluten free buckwheat pizza was made using rucola from the garden. 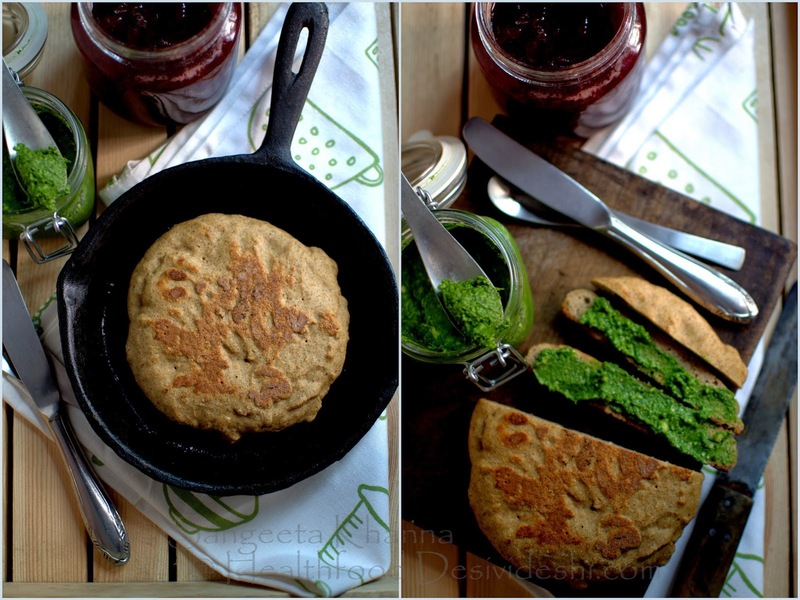 I keep baking a few pan breads in between and this pesto is a great accompaniment with those too. This one was a sourdough gluten free pan bread, complex sourdough flavours that complemented well with hot peppery arugula pesto. 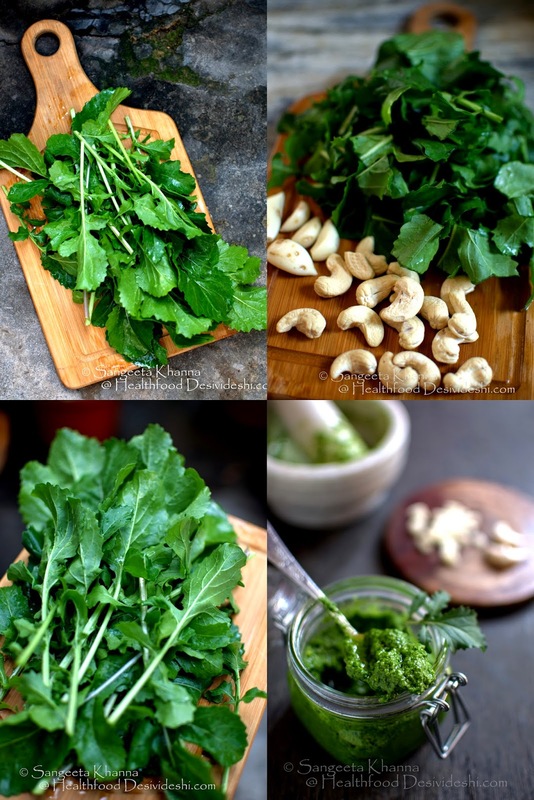 Note that if you find your Arugula too peppery you can always add some coriander greens or baby spinach to the pesto. 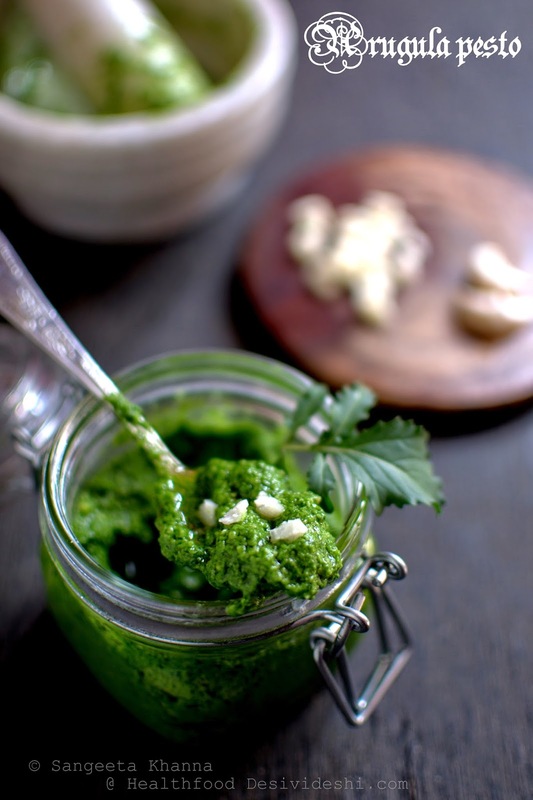 I always prefer using cashew nuts for the sweetness they have, to balance the peppery taste of Arugula in this pesto. 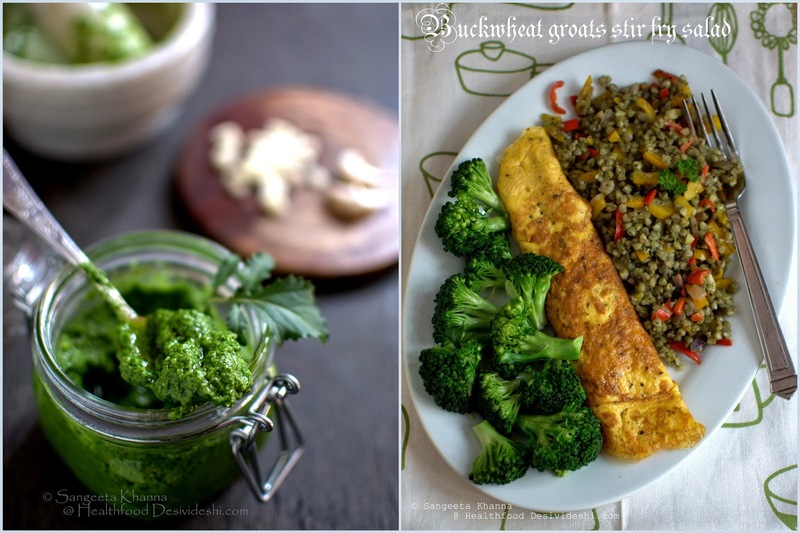 I used this pesto with cooked buckwheat groats to make a one pot meal and it was great too. It's not just pasta and pizza you can have pesto with, there can be many more healthy ways to enjoy such a nourishing pesto. Much to my frustration, the Arugula and Rucola plants got infested with 'leaf miners' this season and I had to discard many leaves. Still it was good enough for everyday salads and pesto for the two of us. I use up even the most mature leaves. 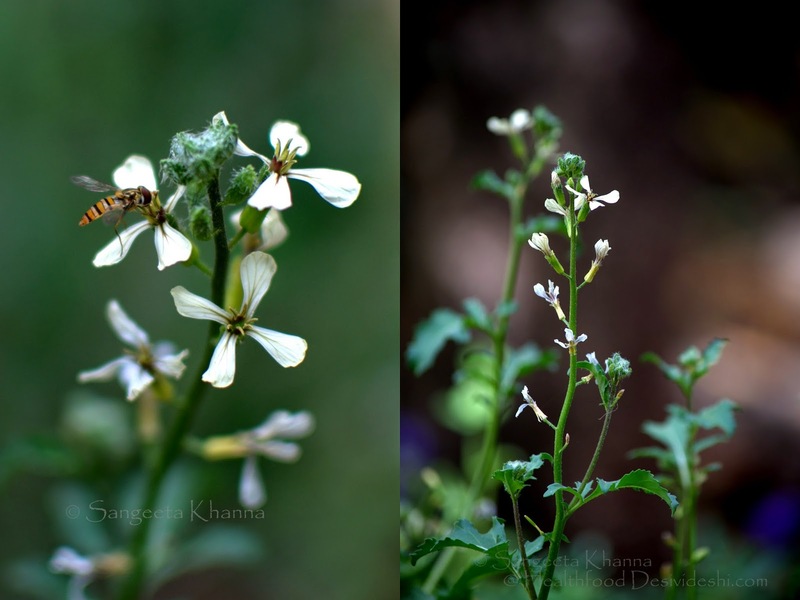 Honey bees have been thronging the Arugula flowers and I was wondering how would be the taste of rocket honey. Recipe of the pesto is simple, the pesto keeps well in the fridge and makes a nice smearing on anything you wish. I have tried it with buckwheat groats stir fry salad, crackers, with ragi dosa and even with bajra flour roti. Believe me it paired well with all these. Make a coarse paste of everything except olive oil in a blender or in a mortar and pestle if you have the time. Empty in a sterilised jar and pour the olive oil on top. Pesto and raw green chutneys are great with every meal. They provide the micro nutrients, antioxidants and good amount of fiber to your meals. You incorporate a larger amount of green in pesto compared to salads. 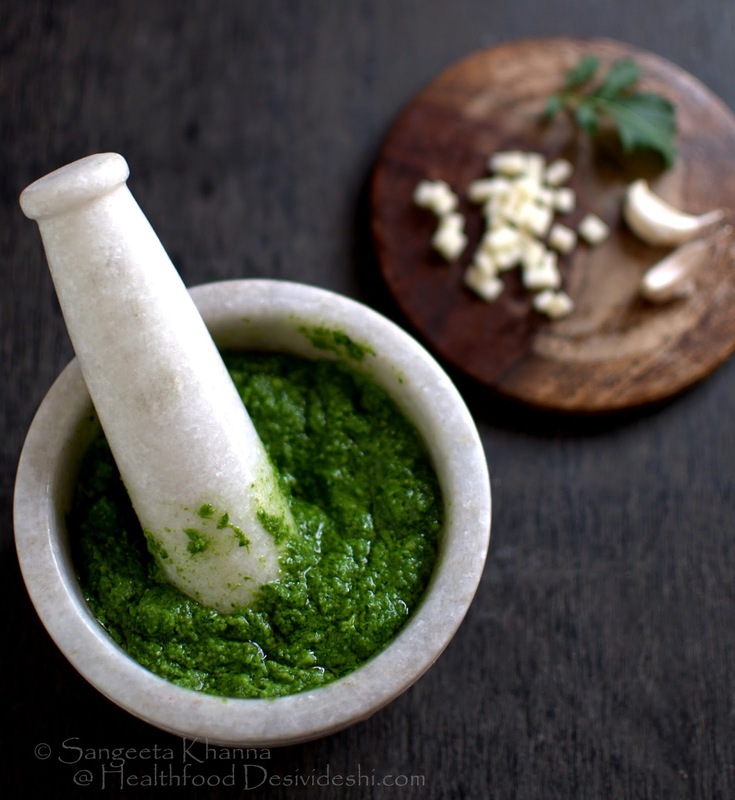 Most importantly, such fresh green pesto and chutneys perk up any simple meal into a relishing experience. Use any greens that are available to you, add seasonings to your choice and pair with whatever food you feel like. 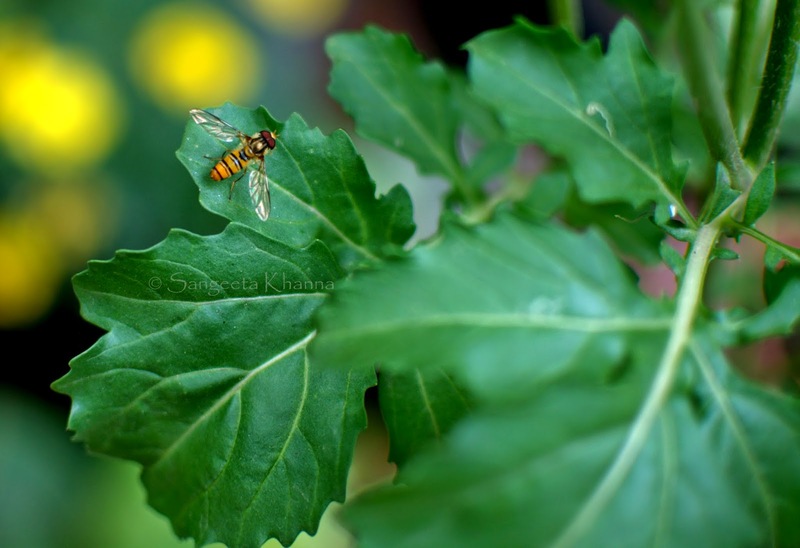 Try and grow a few herbs and greens in your balcony or garden, it is worth all the effort. Don't sweat if you can't, find any locally grown herb and bring it to your table everyday. Any which way. love this idea. i love rocket too but can only handle in small quantities due to the pepperiness. will surely try this soon. I am book marking this! I have been wanting to make my own pesto - but I had no idea you can use rocket. I just finished off a whole lot of rocket! Beautiful shots, especially the flower closeups and the arugula on the board!